More than 500 fifth- through ninth-graders and their parents, teachers and guidance counselors attended the 2016 WE@RIT Open House. This year’s event takes place on Saturday, Nov. 4, in the Kate Gleason College of Engineering. The Women in Engineering program at Rochester Institute of Technology is holding its annual open house from 9 a.m. to 1 p.m. on Saturday, Nov. 4, in RIT’s Kate Gleason College of Engineering. 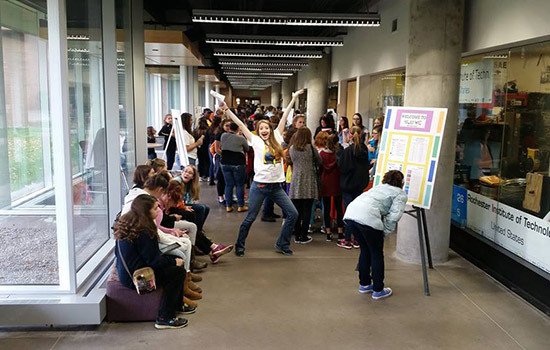 “This is a ‘by-women-for-girls’ event, best described as a ‘buffet of engineering activities to explore,’” said Kathy Ehrlich-Scheffer, Women in Engineering (WE@RIT) program director. The “buffet” is free and intended for girls in grades 5 through 9 and their families, teachers, guidance counselors and community leaders. It is being coordinated by RIT’s female engineering students who designed all the demonstration projects and take-home materials for parents and teachers. This year’s theme explores how engineering impacts society and the role engineers play in designing real-world applications to meet global challenges. More than 30 activity stations will be accessible throughout the day featuring projects about biomedical, chemical, computer, electrical, industrial and mechanical engineering. “While some activities are making re-appearances from years past, each design team is required to come up with at least one new activity each year, assuring that there will be something new for all of our visitors to see in each engineering discipline,” said Ehrlich-Scheffer, who added that each activity will have an accompanying hand-out that adults can use to continue conversations about preparing students academically for careers in engineering and other STEM fields. In 2017, RIT welcomed one of its most diverse freshman classes. In the engineering college, 25 percent (172) of its 688 first-year students are women. The national average for women graduating from undergraduate engineering programs across the country is slightly more than 20 percent, according to the American Association of Engineering Education. At RIT, the college has surpassed that, graduating nearly 24 percent female students in the 2016-2017 academic year. WE@RIT and its open house programming have encouraged both interest by K-12 students to consider engineering as an option and provided mentorship and leadership opportunities for current female engineering students prior to entering the workforce. The open house is also a means to increase participation of under-represented groups in engineering and STEM fields. Harris Corp., a long-time supporter of the engineering college and WE@RIT programming, provided $600 stipends to cover travel and/or food for several schools from the Rochester City School District, Ehrlich-Scheffer explained. This year’s open house is sponsored by Verizon. More information about attaining a stipend and about the event can be found at the Women in Engineering website. Attendance at the open house is free; participants are asked to register online.